Here in the Rocky Mountains the seasons are changing. We like to get out and see all the colors especially in the aspen groves. One thing to keep in mind though is this is the time of year where hunting season is also going on. The reality is that hunters are also lurking around the forests with loaded guns and in camouflage. There are all kinds of hunters. Some do everything by the book. They have taken hunter’s safety and firearms safety courses and even go back and take them again every year or so to stay on top of things. They go and shoot periodically throughout the year and stay acquainted with their guns. They would never think of shooting blindly at a moving object through the trees and bushes without knowing 100% what they were shooting at. Another type of hunter only comes out during hunting season. He is not as likely to have taken a recent hunters safety or firearm safety course. This is the type of hunter they may fall prey to ‘Buck Fever’ and possibly take a shot at something without being 100% sure of what they’re shooting at. The worst type of hunter, in my opinion, is the one who mixes alcohol and hunting. And there are a lot of them that do it. This is their chance to get together with their buds and have good time. It’s hard enough getting a clear shot in the forest as it is, then compound this with bad judgment because of drinking and we’ve really got a problem. Wear a bright orange vest. This is the universal sign to a hunter not to shoot. Wear bright clothes ~ avoid earth colors that blend in to the scenery. Ride with a buddy ~ more people and horses mean more noise. Put an orange helmet cover on. Carry a whistle ~ make it clear you’re not a deer. Braid bright orange ribbon in your horse’s tail. Put some orange vet wrap or orange splint boots on the bottom of your horse’s legs. 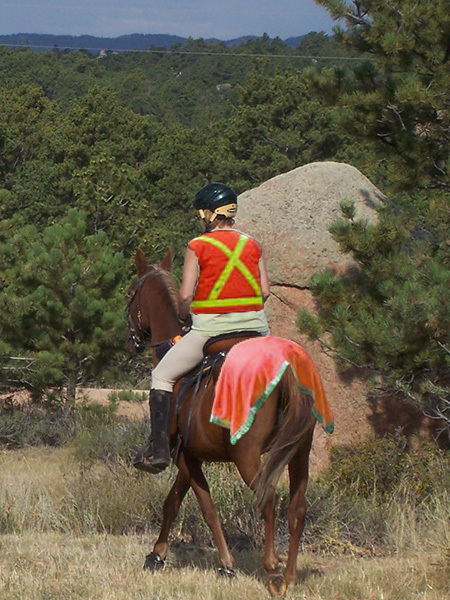 Use an orange rump sheet on your horse. Some people will attach a bell to their tack. Avoid riding at peak times ~ most hunters are out at dawn and dusk. If you come across hunters be friendly. Talk with them and tell them your planned route and find out which way they are going. Most hunters are good sportsmen who follow the rules. Keep in mind that we are able to ride and enjoy trail riding year around but hunters only have the legal right to hunt for a relatively short time so be courteous. Be safe out there!